Especially suitable for macro photography of subjects from flowers to insects to food and anything that may require controlled, close-up light, the Macro Twin Lite MT-26EX-RT is compatible with all EOS Digital SLR cameras and is designed to work in tandem with Canon's EF and EF-S Macro lenses*. It combines two rotatable, detachable flash heads that can be controlled independently to provide an amazing sense of three-dimensional light. Extensive, multi-source lighting setups are made simple thanks to the Macro Twin Lite MT-26EX-RT's radio transmission wireless flash capabilities**. Operability is enhanced with improvements across the board including two removable diffusers, a new LCD screen and smart, redesigned controls. The Macro Twin Lite MT-26EX-RT is a portable, indispensable lighting tool for anyone serious about enhancing their close-up photography. Versatile and ready to be adjusted for a variety of applications, each of the Macro Twin Lite MT-26EX-RT's flash heads can rotate up to 60 degrees horizontally and 45 degrees vertically. They're also completely detachable, allowing easy positioning for the scene. The Macro Twin Lite MT-26EX-RT's front ring can also rotate independently, helping to ensure flexible control and freedom to create a lighting environment tailored to the subject at hand. The Macro Twin Lite MT-26EX-RT has a maximum Guide Number of 85.3 ft./26m* at ISO 100 when both sides are firing. This delivers powerful lighting head-on, and thanks to independent output for each flash head, natural-looking, three-dimensional and directional lighting effects can be achieved with ease. * Guide Number reflects the amount when both sides are fired. Flash output for quick flash (green ready light) is approximately 1/2 to 1/6 of full output (depending on the charge status). For high flexibility and application in multi-flash shooting setups, the Macro Twin Lite MT-26EX-RT can be controlled wirelessly through optical or radio transmission**. As the master unit of up to 5 groups or up to 15 flash units, the Macro Twin Lite MT-26EX-RT can be easily incorporated into numerous, sophisticated wireless setups both in the studio and out in the field. ** Wireless multi-flash shooting via radio or optical transmission is supported up to 1/128 in manual flash exposure mode. The Macro Twin Lite MT-26EX-RT has expanded manual controls that enable impressive, subtle results with ease and are easily adjusted on the LCD panel. Each flash head can be controlled independently in 1/3-stop increments. Flash emissions can even be set as low as 1/512*** to suppress blown-out highlights in close-up photography, which is helpful when photographing high-speed subjects like hummingbirds or butterflies, and to achieve optimal lighting adjustments in a wide variety of situations. *** 1/512 flash emission can be selected with manual flash setting. Manual high-speed sync is supported only up to 1/64. The Macro Twin Lite MT-26EX-RT's dot matrix-type LCD panel offers improved visibility, with a new user interface that can display at 5 different brightness levels and in green or orange backlight illumination. This customizable design allows flexibility to adjust light intensity and color of the LCD to suit the shooting environment. In addition to its new LCD panel, the Macro Twin Lite MT-26EX-RT features a number of enhancements that not only expedite operation, but help ensure reliability. A new selection dial, set and function buttons, plus backlit operation buttons provide more intuitive operation, while new locking mechanisms help ensure continued, error-free use. The Macro Twin Lite MT-26EX-RT's metal mounting foot also features a new locking pin and a one-touch lever for secure attachment and speedy detachment that helps prevent dust from interfering with the electric contacts. Finally, a new lock release lever has been added to the battery cover to help ensure the power stays on. The Macro Twin Lite MT-26EX-RT includes a pair of new high-luminance white LED focusing lamps that define the field of view and makes focusing simple. Turned on and off by pressing either the shutter button or the dedicated lamp button on top of the flash unit or the shutter button, the focus assist lamp can easily be operated while handholding the camera. Brightness can be adjusted within 5 increments and the lamp can be directed to stay lit for approximately 20 to 60 seconds. 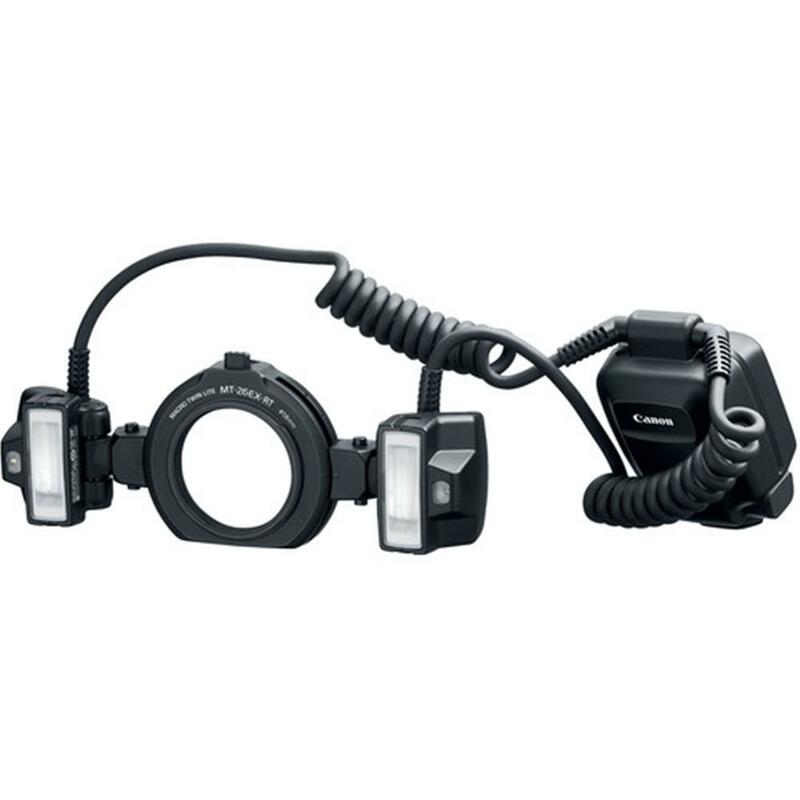 The Macro Twin Lite MT-26EX-RT can recycle to full power output in approximately 5 seconds. This significant enhancement means faster response times, less down time and fewer missed opportunities. The Macro Twin Lite MT-26EX-RT is designed to work perfectly with all of Canon's EF & EF-S Macro lenses****. Easily mounted to the front of the lens, it can quickly be integrated into a close-up photography workflow. For reliable operation even when changing exposure parameters, the Macro Twin Lite MT-26EX-RT is capable of firing repeatedly at roughly 50 KHz intervals, supporting flash sync at all shutter speeds. Its high-speed sync helps ensure even illumination all throughout the composition. To create a soft, expansive light source, the Macro Twin Lite MT-26EX-RT comes with two removable diffusers that scatters the flash's illumination more widely and with less intensity. The Macro Twin Lite MT-26EX-RT detects when the diffusers are attached and can automatically determine the appropriate intensity of illumination to compensate for any light lost. By evening out the light source, the diffusers are especially effective in minimizing shadows while emphasizing and maintaining detail in highlight areas.